#1 New York Times Bestseller Peter Telep is back with The Secret Corps, his latest pulse-pounding thriller incorporating a call to action unlike anything seen before in contemporary fiction. When a small town home invasion results in a tragic death, retired Marine Master Sergeant James “Johnny” Johansen agonizes over questions whose answers threaten his loved ones, his career, and his company. The most serious question of all—is Johnny’s family linked to Islamic extremists in the United States? Johnny turns to Willie, Corey, and Josh—his former brothers-in-arms. Relying on their skills as highly-trained Marines, the team uncovers a treacherous plot involving a renegade defense contractor and the highest levels of a U.S. intelligence network. Risking their lives to reveal the shocking details of the operation, Johnny and his friends discover that hundreds of terrorists are poised to launch a coast-to-coast attack on American soil. Time is running out! Who can Johnny trust? No one except . . . 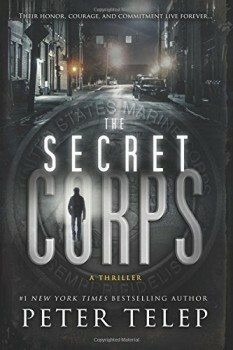 THE SECRET CORPS is available from Amazon. –Major J. W. Dorsey IV, USMC (Ret) Vice President, Glock, Inc.
Peter Telep is the author of more than forty novels. With the assistance of technical advisors from all branches of the service, he has documented the exploits of U.S. Army Special Forces in Afghanistan, tank platoon commanders in Korea, and mercenary fighters in Angola, Uzbekistan, and Vladivostok, among others. His collaboration with Tom Clancy, Against All Enemies, debuted at #1 on the New York Times Bestsellers List. Additionally, he has written many bestselling novels based on Tom Clancy’s Ghost Recon, Endwar, and Splinter Cell video game series. Mr. Telep’s work on The Secret Corps involved extensive research, including a trip to the Sig Sauer Academy in New Hampshire, where he received hands-on training in many of the weapons featured in this novel. He also traveled to Camp Lejeune, North Carolina, where he had the opportunity to pilot a Riverine Patrol Boat and make an “unauthorized” J-turn, much to the surprise of his soaked but smiling hosts. Find him on Facebook: facebook.com/pages/Peter-Telep/194193593950279 Or email at ptelep@mac.com.